Get ready to have fun in the water this summer! Photo: Long Island Boat Rentals. Even though people are constantly reminded by the name Long Island, they forget they are living on an actual island. And those that do take advantage of the marine environment that surrounds them usually do it by way of going to the beach. An astonishing amount of people that live here rarely head out to sea, usually due to the lack of a power or sail boat, or the knowledge to operate either one. Sure, some people may take the ferry, but that is no comparison to the thrill of being at the helm of a sail or power boat, experiencing the tremendous vistas and activities with your family and friends that comes with being on the water. For those folks interested in doing something different and discovering what the surrounding waters have to offer, Port Washington is the place to go. You can rent whatever suits your fancy: A power boat, a sailboat, a rowboat, a kayak or a paddleboard. You can go fishing, tubing, sailing, or just enjoy the beautiful sights of the Gold Coast. And don’t be surprised by the “rentals,” as they offer a wide array of services that will get you out on the water the way that suits you best! Don’t know how to operate a sail or power boat – no problem – Port Washington offers the training you need to get out on the water on your own! For those that are still not comfortable at the helm, or just want to fully enjoy their time boating, this company has the solution. You can hire a captain to safely navigate you to your desired destinations,allowing you to sit back, relax and enjoy the astonishing views and boating activities. Trips can include visits to the Statue of Liberty, swimming in Oyster Bay, or lunch at a Connecticut restaurant – whatever your wish. For very special celebrations and parties, you can book one of the private yacht charters, which comes with a captain included. If you expect to be a frequent boater, you have the option of joining a Boat Club or purchasing a seasonal package from the sail and power boat rental vendors. Either way, it can be a more cost-effective way to have a sail or power boat at your disposal. So it you're thinking about planning an excursion on the Sound, make Port Washington your “Port of Call” – there are plenty of options available to fit your desires, and since they are all close by, there’s time to do several in a day! 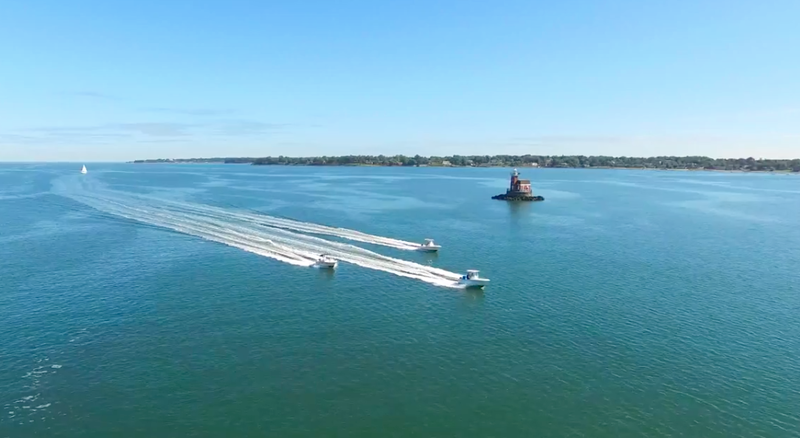 Boat Rentals: The Gold Coast’s premium boat rental company, Long Island Boat Rentals has power boats from 13’ to 24’, offering easy access to some of Long Island Sound’s most beautiful waterfronts. Bring your family and friends and enjoy cruising, relaxing, fishing, the Gold Coast. No boating experience? We can arrange for you to learn, or you truly enjoy the experience with a captain to take the helm. Private Yacht Charters: With captains at the helm, we have both power and sail boats to 50’ to make a special occasion a memory you will never forget. Excursions include dinner at a waterfront restaurant, dining in the light of New York Harbor and the Statue of Liberty or a tour of the Gold Coast Mansions along Long Island’s North Shore. Whether you're looking to row boat or kayak, Atlantic Outfitters can supply your with your boating rental needs.